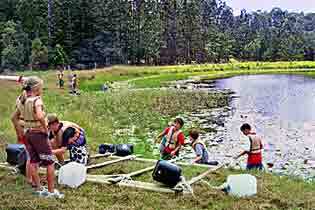 School camps, school group excursions, outdoor education centres (OECs), SE QLD and Northern Rivers NSW. Outdoor adventure, team building and corporate retreats in the Byron Bay - Gold Coast region of Australia. School Camps, Adventure Camps and Outdoor Education Centres in the Byron Bay, Tweed Valley, Gold Coast Region of Australia. From working farms and sub-tropical fruit orchards to environmental parks and secluded retreats, there's a variety of unique properties in the Northern Rivers and Gold Coast hinterland, providing the perfect location for outdoor expeditions, team building, adventure retreats, school camps, excusions and environmental education.